As we begin 2019, E. P. Collector label is coming with another surprise! 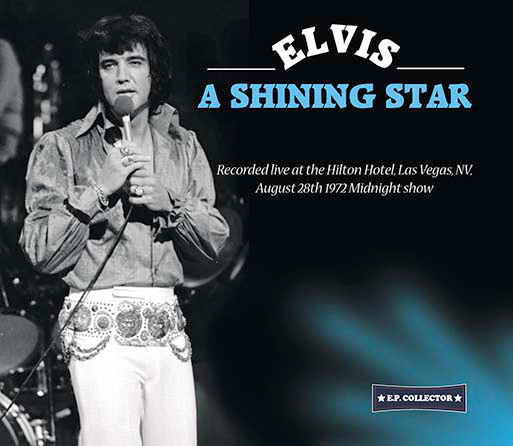 The Las Vegas, August 28, 1972 Midnight show is previously unreleased and moreover, it was never available in solid sound, until now! It’s not easy to write something new about the August 1972 Las Vegas shows, without repeating well-known facts. Nevertheless, there’s one thing that stands out – it was Elvis’ very last Vegas season when he was singing consistently well during all of his concerts. There was not a single average or controversial show and no cancellations, either. Compared to Elvis’ April and November ’72 tours, where he was noticeably bloated and pale in the face, in August he was trim and suntanned. He looked absolutely great and his voice was excellent, too. This CD is packaged in a nicely designed digipak with collection of great images taken during August/September 1972 concerts. If you've enjoyed the previous August 1972 releases from the „FROM JAPAN WITH LOVE” miniseries, called „A Sensational Opening Night“, „Everybody Let’s Rock” and „Heart And Soul… And Some Mighty Fine Rock’n’Roll“, then you are sure to enjoy this forthcoming release, too! 01. Also Sprach Zarathustra (2001 Theme) - 02. C. C. Rider - 03. Johnny B. Goode - 04. Until It’s Time For You To Go - 05. You Don’t Have To Say You Love Me - 06. You’ve Lost That Lovin’ Feelin’ - 07. Polk Salad Annie - 08. Instrumental Intermezzo - 09. What Now My Love (with false start) - 10. Fever - 11. Love Me - 12. Blue Suede Shoes - 13. Heartbreak Hotel - 14. All Shook Up - 15. Love Me Tender - 16. Hound Dog - 17. I’ll Remember You - 18. Walk That Lonesome Road (J. D. Sumner & The Stamps Quartet) - 19. Suspicious Minds - 20. Band Introductions - 21. My Way - 22. A Big Hunk Of Love - 23. You Gave Me A Mountain - 24. medley: Mystery Train / Tiger Man - 25. Can’t Help Falling In Love.